With Wednesday's 11-inning victory at Seattle, the Baltimore Orioles have won their last 15 extra-inning games, the longest such streak since 1949. One might hypothesize that an extra-inning game is like a coin-flip, with each team having close to a 50/50 chance to win. Once a game goes beyond nine innings, it can be decided by as little as one extra frame, where one swing of the bat can be decisive. Perhaps the home team is at a little bit of an advantage, but baseball in general has one of the smallest home-field advantages among popular team sports. If one flipped a coin in series of some defined length (e.g., sets of 10 or 15 flips) and then plotted a histogram of how frequently different breakdowns of heads and tails occurred (e.g., 50% heads/50% tails; 20% heads/80% tails), the most common occurrence in the long run would be 50/50. Other divisions close to 50/50, such as 49/51, 51/49, 48/52, and 52/48 would also be fairly common, though progressively less so the further one moved away from 50/50. As long as the number of tosses in each series was not too small, extreme breakdowns such as 0% heads/100% tails and vice versa would be very rare. This pattern of outcomes yields the familiar "normal" or "bell-shaped" curve. To see if the outcomes of extra-inning baseball games are like coin flips, therefore, we can examine teams' winning percentages in extra-inning games and see if the frequencies of different winning percentages resemble the bell-shaped distribution of coin-flips. Using ESPN.com's "expanded standings" from 2012 (as of last night), 2011, and 2010, I generated 90 team-year winning percentages in extra-inning games (see column with the heading "XTRA"). In other words, the 2012 Orioles, 2011 Orioles, and 2010 Orioles would be three separate data points, as would the 2012 Yankees, 2011 Yankees, and 2010 Yankees, and so forth. For the 2012 season to date, Baltimore's extra-inning record is 15-2 (.882), as shown in the far right-hand side of the following graph (which you can click to enlarge). As the graph shows, .500 is the most common extra-inning record in the past three seasons, which occurred 15 times among the 90 team-specific data points. This result is consistent with extra-inning games being like coin-tosses, as is the general tapering off of the curve in both directions from 50/50. Under a prior assumption of a 50/50 success rate in extra-inning games, the probability of a team (in this case, the Orioles) winning 15 or more out of 17 is about 1 or 2 in 1,000, according to this online binomial calculator from Vassar College. Such an occurrence would thus be rare, but would be expected to happen every several decades. Keeping in mind that Major League Baseball expanded to 26 teams in 1977, 28 in 1993, and finally 30 in 1998 (history of MLB expansions), one would have to go back 36 years to compile roughly 1,000 team-years. Interestingly, as noted above, one must go back 63 years, to 1949, to find an extra-inning winning streak at least as long as the 2012 Orioles' 15 games. Back in 1949, the Cleveland Indians won 17 straight. At the low end of the above distribution stands the 2012 Houston (Dis)Astros. 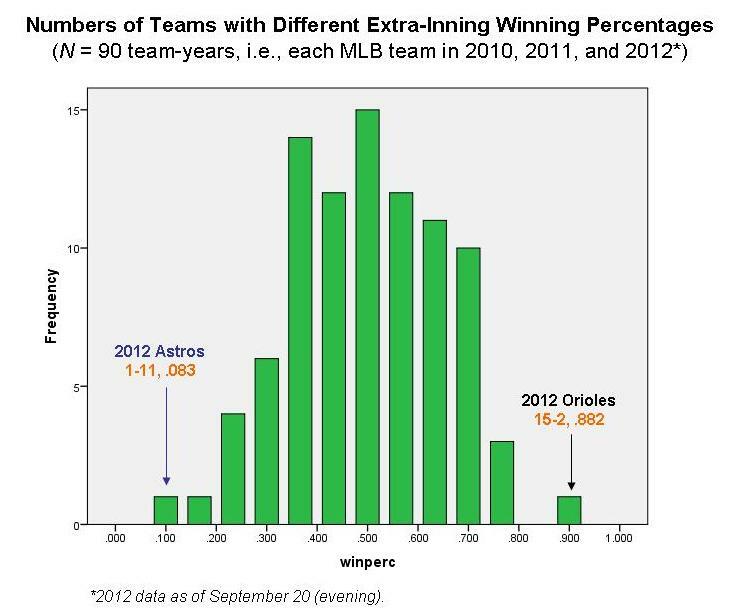 The probability of a team winning 1 or fewer out of 12, given the 50/50 assumption, is around 4 in 1,000. 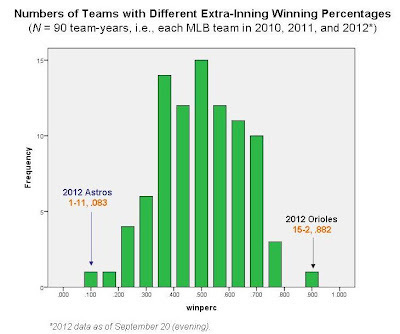 Further supporting the idea of extra-inning games as coin flips is the finding of non-significant skew (tilt to the right or left) and kurtosis (exaggerated peak) in the plot of teams' extra-inning winning percentages. UPDATE: On Saturday afternoon, September 22, the Orioles extended their streak to 16 straight wins in extra-inning games, with a 9-6 win over Boston in 12.